I'm often in need of a quick, elegant hors d'oeuvre to keep guests busy and on the other side of the counter while I'm finishing dinner preparations in the kitchen. I like this truffled white bean puree because it's simple, I can make it ahead, and it's an unusual combination that raises the eyebrows a bit. You could serve it with crackers or toasted pita bread triangles, but I love making tiny cups out of cucumbers. Buy small Persian cucumbers - the ones with the thin skin you don't have to peel - and hollow out a little divot with a melon baller. You can make these a few hours ahead and store them in the refrigerator in a zip-top bag, between layers of damp paper towels. If you can't get your hands on a fresh truffle to grate on top (or the budget doesn't allow it), buy a tiny jar of truffle salt and use that instead. You'll get the same flavor, although not the same visual. This appetizer couldn't be easier: White beans pureed with lemon and truffle oil. Serve in tiny cucumber cups or with crackers. Make the bean puree: Put the beans, lemon juice, lemon zest, and truffle oil into the bowl of a food processor. Process until very smooth. Add salt and pepper to taste. Set aside to let the flavors blend. (Can be made 1 day ahead; store covered and refrigerated. 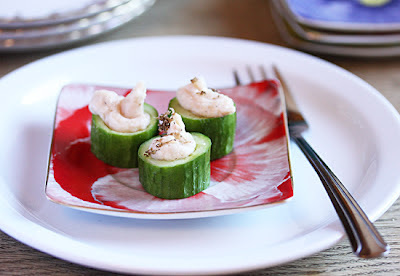 )Make the cucumber cups: Wash and thoroughly dry the cucumbers. Cut off the ends, then slice the cucumbers into 1-inch rounds. Using a small melon baller or the tip of a very small spoon, hollow out one side of each cucumber slice, being careful not to cut all the way through. You'll end up with a fingertip-sized depression in each slice.Transfer the bean puree into a piping bag, or use a zip-top bag with the corner snipped off. Pipe a swirl of the truffled bean puree into each cucumber cup. Grate a little of the truffle on top of each piece. Serve immediately.